•	Today I met with Lockheed Martin in the dressing room after our sparring match. I intended to interview them, but it became a bit more of a duel… read and anticipate! The Military-Industrial Complex is the leading cause of environmental destruction, human deaths and social destabilisation. It’s worth putting all of your energy into stopping to make the world a better place for the world’s most vulnerable and for yourself. In the battle between sanity and greed, the best place to be is non-violently in the way of war making. Liz Geyer is a very proud Strayan, with some very probing questions. Okay. Let’s start at the beginning. 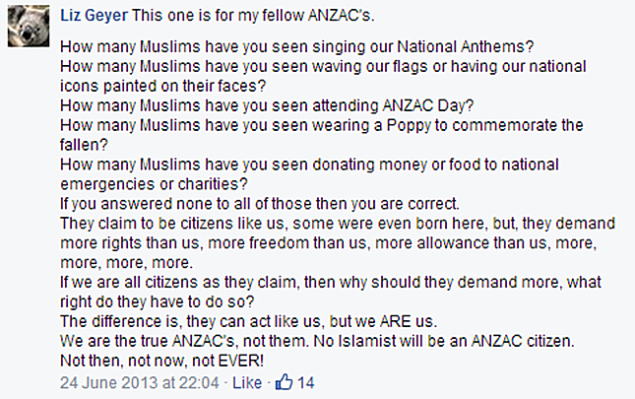 You’re not an ANZAC and nor is anyone else on Facebook. The last ANZAC passed away over a decade ago. If you mean ‘Advance Australia Fair’, here’s one example. For the most part, though, how do you tell? Perhaps you can get a crowd shot from a major sporting match where the anthem is played, and go through it and tell us which people in the crowd are Muslim and which are non-Muslim. And explain how you can discern this based on just looking at someone. Please. Triple J’s Hack program took many callers on the “Bogan” phenomenon. 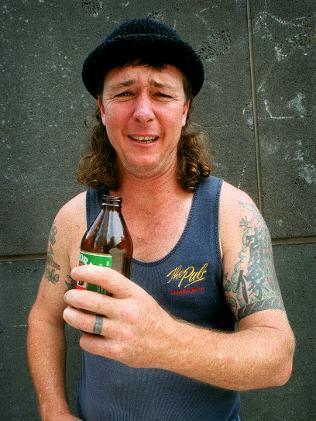 What does bogan mean, is bogan good, are we all a little bit bogan? This man’s answer would sound like a good response. The embrace of all types of people, even beer swilling, misogynist, love their car-types. I really liked that movie “Happy Feet”- among the morals of that story was that of “everyone is different and we should all be accepting and loving”. I am not a smart person, but I think that this is the basis of what political theorists call “liberalism”. Liberal being freedom and individuality- you can do what you like, so long as you don’t hurt anyone else. Talk rough, wear flannel and drink VB- that’s fine. Wear a suit, eat blue vein cheese and listen to Rammstein, we’ll accept you. Be a penguin who can’t sing, but dance- eventually we’ll learn to like you. Liberalism. Cool. I think one of the self-observations I have to make over the last few years is that society allows you to be different, as long as you’re the same as the rest of society. Yeah, I just got a paradox into my blog. Think about that for a moment. What seems like a noble tolerable statement, I believe is actually quite tricksy with a brief value analysis. Let’s start with what is good in this statement. Working. Yeah, I think we can we all agree that working is not only good for the people around you, but also for your sense of self-worth, your peace of mind and your health. But the man did not say work did he? He said “have a job”. So having a job, any job I assume is good? If I work in a uranium mine in the Northern Territory and I know some of the stuff I produced led to the deaths and severe pollution at Fukishima is that still good? If I am coal-seam gas worker and my labour contributes to environmental degradation and global warming, is that still good? Ok, I guess I wanted to briefly look below the veneer of the ordinary where we as individuals in society assume that having any job is good and people without jobs are bludgers. Not to mention the mentally ill or those in the working class who had insecure work their whole lives and now find themselves aged between 45 and 67 and no chance of ever gaining paid employment. They must be bad according to my tolerant liberal friend. Paying taxes. Now I have been in hospital. Thank you to everyone who contributed taxes so I could stay in hospital for three days in 2012. Taxes are good for schools and hospitals. (Those, along with lots of other services are being massively attacked by governments who run this line of “work for it yourself, or else you’re a bludger” or “sure, wear clothes from Culture King or I dunno, is Supre still around? Just work for it yourself”). But taxes also subsidise the coal industry and other mining especially in diesel fuel subsidies, everyone else has to pay those taxes except those doing the most damage ecologically… hmmm. This, of course, is not to mention the billions of dollars paid to the Military-Industrial Complex to make money out of dominance, death and destruction. Universities, the bastions of free speech and free thought are now majorly co-opted by the MIC to research their drones and weapons that kill people on a daily basis. So still good for my taxes to go to that? So in my liberal sample’s answer about bogan being ok, people who work harmful and destructive jobs and who pay taxes to causes that are inhumane, environmentally homicidal and with complete social irresponsibility are ok. On top of that, you can put your money into cars to burn more petrol and destroy the environment even further and as Bogans are considered dumb or unthinking, let’s even celebrate our unawareness to our social and ecological connections. And this is what makes a person “good”. That acceptance of everyone who is different so long as they contribute with a job that pays taxes, is extremely flawed. Australia’s ‘liberalism’ and love of freedom extends only to those who do these things. Now I want to swing a bit. Since 2004, the United States has pursued a drone war in Pakistan. Drones are unpiloted craft that are flown by remote control via satellites. So an operator in Washington D.C. could be looking at real-time graphics of real people in Afghanistan. The US claims that the drone wars are a way to pursue Al-Qaeda or Taliban militants without risking US causalities. 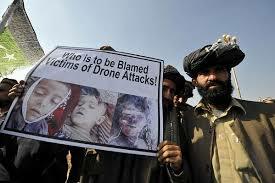 Drones have killed, in Pakistan alone, 200 children since 2004. Drone strikes work by hitting the target, presumably a Taliban fighter and after they’ve been blown up, people rush in to help and the drone operator fires again. The legalities of drone strikes in a country that the US has not declared war on aside, it is clearly illegal to attack any person who is attempting to give aid to injured people. Aside from being illegal, to me, the sheer bastardry of such an act defies belief and can only be motivated by very malicious, evil intent. The assassination of the Taliban leader at a time when the Pakistani government was claiming to be in negotiations for a truce seems to be more about destabilising the region than about American security. But I digress. Australia’s military is critical in US drone strikes. The joint facility at Pine Gap helps locate and target for the drone program. The deaths of the kids and the illegality of this got to me. So along with some mates, we decided to take our concerns to the Australian military and before the action, I went through some now familiar emotions. I didn’t want to dress up as Santa and make a noise in public. I didn’t want to look stupid and I didn’t want to get arrested. Rather than being overwhelmed with, well kids in Pakistan are being bombed, that’s much worse than my momentary embarrassment, I had a begrudging “well, someone has to do it” and off I went into town. (Video posted below). I felt good after, if a little drained, but in reflecting and struggling to find my voice for this blog, I wondered, why my initial morning hesitation? Listening to triple j the other day, I realised, that even though I question and challenge general society view of what is good and what is bad, I had succumbed to the same liberal thinking. I was feeling bad because my individuality was different to society’s norms. I was bait for the “get a job” crowd call and for people to say I’m protesting the wrong group, that I am a dickhead, and that I am wasting my time. But like the liberal answer on Hack, a quick value analysis shows a different story. Kids are dying! The region is being made more unstable and my further or deepen the war. People are fighting when there is more than enough on this rich earth for everyone to work a bit, have a shirt on your back, a roof over your head and food in your belly. Its insane and its greedy and inhumane. This gives you a greater understanding of the conflict and humanises in it a way I can not. War is happening, people are dying and suffering is the way of life for many people. And it doesn’t have to happen! So until war is over, my work is to talk about and raise the profile of the peace movement, this work gives me no income (in fact I have no income at the moment) but I feel that right now in human history, it’s the most important work for any of us to do. More than 200 kids killed in Pakistan drone strikes since 2004. I arrived in Rockhampton on the 3 July. 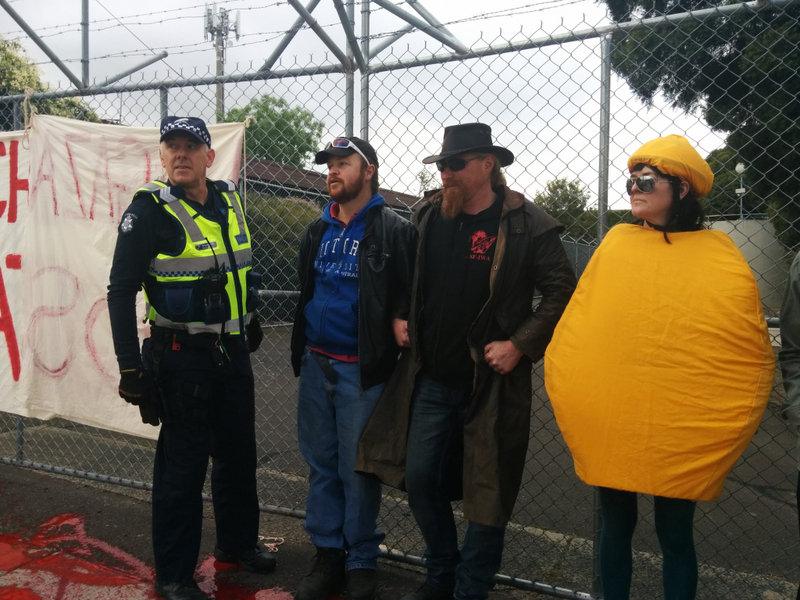 I had come up to support Graeme Dunstan, veteran peace activist of Peacebus.com fame and to protest the US/Australian Alliance as it manifests at the biennial joint Military Exercises known as Talisman Sabre. The US/Australian Alliance has seen Australia follow the US into wars in Korea, Vietnam, Iraq, Iraq and Afghanistan, just to name the wars that we know of. Graeme had been active in the Talisman Saber 2011 Peace Convergence. He assisted Bryan Law perform a Ploughshare action in which Bryan had smote a Tiger Armed Reconnaissance Helicopter with a mattock. The strike caused an estimated $170,000 worth of damage and disabled the helicopter. The media at the time took the view that people should not be damaging helicopters that had helped Queenslanders during the January 2011 floods. The media did not state that the Tiger helicopters are not capable of air drops or rescuing people. Lightweight, they are a flying weapons platforms costing $35 million each, or in the words of the late Bryan Law “vile death machines”. Bryan and Graeme were to face trial in Rockhampton District Court on 19 August. During last Easter Bryan died, so now Graeme will be in the dock facing the charge of wilful damage of Commonwealth property alone. Talisman Sabre (TS) is a biennial joint training exercise between the United States and Australian military. TS13 was bigger than ever before with some 28,000 troops involved. The line taken by politicians is that it helps secure Australia and ensure that if Australia were to come under attack, the training would help the US be better able to defend Australia from threat. The ADF (Australian Defence Force) however admits, that the exercise is also about “interoperability”. That is, it seeks to make it easier for the US to use Australian armed forces in their foreign wars of invasion and occupation. Two recent examples of this are Iraq and Afghanistan. These are not war games, but war rehearsals for the invasion and occupation of states that have economic interests to those in the United States. The first action I undertook as part of TS protests was a SpeakOut at the gates of Western Street Barracks in Rockhampton, now known to the military as Army Base Rockhampton. It is the main staging ground in Rockhampton for the War Rehearsals. The southern perimeter of the Shoalwater Bay Exercise Area is about 100 km north east. The fourth of July and Graeme had dubbed the day, the “Independence from the US Day”. Ten people attended the event but Graeme, because of his Ploughshare notoriety, drew all the local media (ABC Radio Capricornia, WIN and Seven News) who were recording the event and, because Rockhampton is the media hub for Central Queensland, this meant a potential audience in the order of 190,000 people. Standing in an array of colourful flags and banners, Graeme delivered a fire brand speech Graeme condemned war, the war rehearsals and the recently leaked confirmation that our “powerful friend is snooping on all our emails and all of our phone calls”. I got a chance to speak next. Immediately all the cameras were turned off. Only slightly undeterred, I called for an independent and peaceful Australia. A country that doesn’t strip millions of dollars from universities to fund schools as the Federal Government is planning on doing to fund the Gonski review, but instead takes money out of the botched Joint Strike Fighter program (estimated cost $1.4 billion) or out of the Collins Class submarines which cost a $1 billion each. Also present at the SpeakOut were Capricornia Greens candidate, Paul Bambrick, and partner Edwina Mullany, an art teacher at Yeppoon State High School. Vocal against TS and the over reach of the security establishment Paul attracted lots of media attention that day. I wanted to acknowledge Paul and Edwina for their generous support and hospitality for me and the Peace Convergence crew. My main job, apart from supporting Graeme, was to set up Havachat for accommodation. Havachat is a casual drop in centre and eccentric art gallery in the main street of Rockhampton CBD and Rockahmpton eccentric, Chris “Pineapple” Hooper, formerly of the Funny Farm, a pineapple farm near Emu Park, is it’s proprietor. A café of sorts for there is a kettle and tea bags available, if you’re broke, Chris will give you a free cuppa. Out front is an array of lounge chairs where local discontents sit about and chat. Out back is a huge warehouse space gradually filling with stuff which Chris collects. His speciality is multi seated bikes. Bryan Law’s peace trike has pride of place there. Chris generously opens up Havachat to serve as a base for the Peace Convergence. My job was to create space amongst the stuff for laptops and bunks. Most of us stayed there when we were not in Yeppoon or breaking into Shoalwater Bay. Central and friendly, easy access for police liaison who came by regularly and media crews, it served us well and I had a lot of good times there over the three weeks that I was there. If you’re in Rocky, drop in to 20 East Street and say g’day to Chris. The Peace Convergences past had established strong links with the local Darumbal people, the local traditional owners. It began in 2007 when Darumbal elder Auntie Jeanette welcomed two women anti US bases organisers from Guam and Hawaii. Graeme, amongst others had made a deep personal connection with Auntie Jeanette, and together they had organised a flag making project to dress the NAIDOC Parade for which Jeanette was the principle marshal. As a NAIDOC March it has the biggest turn out in all Queensland. Sadly, Aunty Jeanette passed back into the Dreaming in September 2011. Though her support was missed, the Peace Convergence again had a stall and a presence in the annual NAIDOC March at the NAIDOC Expo where the March went to. I helped Graeme rig and array flags for the March and I also helped Robin Taubenfeld and Treena Lenthall man a Peace Convergence information stall at the Expo. The week after NAIDOC, a small Memorial Service was held for Auntie Jeanette by the Fitzroy River near Havachat. It was attended by a sister, a daughter and a granddaughter of Jeanette and her Peace Convergence friends. On the Sunday before TS begins, the ADF organise “Family Military Open Day” at the Rockhampton Showgrounds. Inside the Seventh Fleet Band and Australian military bands play big band swing music (which I have to admit, was great to listen to) and kids line up to hold weapons of war and climb over tanks and armoured personnel carriers. Peace Convergencers are forbidden entry but offer alternative entertainment outside the gates. In particular, Robin Taubenfeld of Brisban FoE, organised for their distribution of free helium balloons with the CND symbol printed upon. Since this was the first free offering for the arriving family groups, children eagerly took them and carried them into the Open Day. Robin had also brought a photographic exhibition called Children of Iraq which was hung from the Showground fence near the gate, a salutary illustration of the true impact of war on children. Graeme had cheekily advertised the inaugural Bryan Law Memorial Tricycle Ride. He had wanted a trike race but was forbidden by police. Instead he set up a beautifully designed three panel backdrop depicting a Tiger helicopter under the motto in large print “turn attack helicopters into ploughshares”. In front was the tricycle that Bryan Law used on his Ploughshares action and people were invited to sit on the trike and have their photos taken. Some of us also donned “Guantanamo Bay” suits and reminded people that what they were going in to see were not toys, but implements designed to kill and enforce our will on others. One of the costs of these actions is the continuing illegal detention of men who have had their justice denied. Graeme had a hired PA (Peacebus PA had been forbidden) which he used to spruik to the queuing family groups. Using that PA I read out the story of Mamdoud Habib. I strongly urge all readers of this to familiarise themselves with his story as a Muslim Australian citizen, of abduction and torture at the hands of the US military and its cohorts and complicity of the Australian Government. The Open Day was attended by maybe 5000 Rockhampton people, much fewer than the 13,000 expected, and much fewer than the 2011 Military Open Day. Graeme reckoned our war is not for children message was getting through. Channel Nine News Brisbane covered the event, interposed video of 4 and 5 years old boys playing with guns and with shots from the Children of Iraq Exhibition and was critical of the recruiting pitch of the event. Next day the front page of Rockhampton Morning Bulletin carried a photo of a tot on a tank and it drew hostile comments from readers. There was also an article featuring Graeme and the rest of the Peace Convergence. The hard work and dedication of many a peace activist over the years had generated local media space in which questions about the US Alliance can be asked and the call for an independent and peaceful Australia mentioned. On the day of the Military Open Day, Vince Emanuele flew in from Brisbane for the last leg of a four city speaking tour which was organised by Graeme and his Stand Fast friends. Vince is a former US Marine who did two tours of duty in Iraq. When he was told he was to go for his third tour, he refused to pick up a weapon and was honourably discharged from the Marines. Vince suffers from Post-Traumatic Stress (PTS). Usually referred to as a disorder, I disavow that term. I do not think that it is a disorder to see or experience what soldiers do in Iraq or Afghanistan or any war and come back spiritually and mentally scarred for life. Vince spoke on the Monday outside of the gates Western Street Barracks the Peacebus PA booming through the wire to the soldiers within who came out of their tents and offices to hear. Vince’s speech was powerful and Graeme reckons the highlight of his Peace Convergence organising. The next night Vince spoke to a small crowd at the Rockhampton Motor Boat Club. At Yeppoon RSL Club the following night, the Peace Convergence showed the documentary about PTSS and veterans which features Vince and is called “On the Bridge”. Vince was advertised as being available for a Q&A after. It was the last gig of his tour. Before the documentary I met a woman who had seen the posters around town. I did not get her name, but she had a son who had returned from two tours of Afghanistan. She confided in me that he had “changed”. That he was drinking a bit more, that he was less communicative and she wanted more information. We watched the documentary, which amongst others, featured the parents of a young soldier who had come home and slowly displayed the symptoms of PTS, despite medication and a loving family he continued to decline and committed suicide. The mother whom I had spoken to left in tears. I followed her to the car park and told her Vince was going to talk and hearing him speak might offer more information or avenues for support. In tears, she declined and thanked me for showing the documentary. She drove away. I don’t know her name or what will become of her son or her. But it drove home that PTS and the effects of war on veterans and soldiers and young people whom we tell the Defence Force is a good career option is real. These are real lives with real suffering and real deaths. For what gain? Vince spoke briefly about PTS but also about the need for those in the know to care. He asked what are we as activists prepared to do? He reminded us of Gandhi’s call for his followers to walk lovingly into a hail of machine gun bullets. He reminded us that no-one could campaign with Martin Luther King Jr unless they were willing to be savagely beaten by opponents. Before we went to hear Vince speak at the Fitzroy Motor Boat Club, we went to protest outside the Community Cabinet which took place at the North Rockhampton High School Hall and was attended by the recently reappointed Prime Minister Kevin Rudd. Before I went in, I and some others again donned the Guantanamo Bay jumpsuits. Jessica and I started and we stayed on the footpath outside of the school. It was rather wide and large. The whole time we were in Rocky, because of the media around Graeme and the Ploughshares action, we had Queensland Police liaison officers assigned to us. Sgts Kerry Duffy and Joe Aboud who knew Graeme very well. They both went to Bryan Law’s memorial service and we consulted them before every planned action. They had told us that we were allowed on the footpath as long as we didn’t block it. Jess and I sat on the footpath with our placard, silently bearing witness to the torture and illegal detention of human beings, some now proven to be innocent who have spent 11 years on Guantanamo. Within moments we were surrounded by plain clothed Australian federal police agents and also Queensland Police from Protective Intelligence (aka Special Branch). They told us we weren’t allowed there. I said we had been given permission from QLD police liaison officers. One federal officer replied “I don’t know anything about this supposed liaison officer”. Jessica declared, and I followed suit, that we would not move until given a move on order by the police. We sat there and waited. Kerrie Duffy, the QLD police liaison came over and spoke to plain clothes cops and that was the last of that part of that harassment. I sat there for about half an hour, barefoot in my jumpsuit and black hood. Though this was not the coolest reply, it took the wind out of his sails and he left me alone at least. Until he came out and asked about Jess “is that person next to you male or female Greg?” I took my hood off and looked at the officer, “My friend?” the officer nodded “My friend I just met today and they’re helping me out a bit”. I put my hood back on and resumed my pose. To have my name would not take a lot of resources or working out, but I wonder if government/ police/ surveillance might not have something better to do with their budgets then monitor a casual high school teaching/ uni student/ peace activist. If I am up there with the big threats to the State, than the State is pretty safe! I was not the only one who copped this treatment, so I don’t want to big note myself, but as this is my report, I can make myself out to be the star for a little bit can’t I? I went inside the Community Cabinet. After the predictable references to State of Origin and Kevin talking up scrapping the Carbon Tax (he spoke about every aspect of it except for the environmental costs of the move- I suppose that’s fair. What has the environment ever done for us?) The floor was open for questions. My friend, activist and Friends of the Earth mainstay Robin Taubenfeld asked about the US alliance and whether that was the best thing for Australia. Kevin Rudd gave the tired answer of “No one will forget 1942 when the Japanese nearly invaded us. America saved our skin and we’re not likely to forget it.” Now I could do another 5000 words on this subject, but whilst you’re waiting for the video of Vince Emanuele to load, can you just do a quick google of “The Battle for Australia Day”. Have a look at the criticisms of Peter Stanley, the former principal historian at the Australian War Memorial. He criticised Kevin Rudd in 2008 for instituting this Day. There was never a “Battle for Australia” it is historically highly inaccurate to say Australia was under threat of invasion by the Japanese. No other country in the world thinks this, but as part of our paranoid national narrative we love stories of the Asian horde trying to destroy our “Christian” English, white nation. Why do Boat People get such a hard time in the media? So Kevin Rudd spun this lie again to the Australian people and I rolled my eyes. I realised I should have done something more useful, like protest or watch 12 hours of soap opera television. One highlight of the community cabinet for me was the last question. An elderly gentlemen stood up and asked “I’m a retiree and I’m worried. How can we as a country be more humane to refugees and asylum seekers?” I, along with I think quite a few others, gave a long, hard cheer and clap. This was two days before Kevin announced the ultra-draconian PNG solution he did a double answer. Summary “We need to be soft hearted and hard headed on this”. It was a lame answer, appealing to the will of the crowd and the base racism of Australian pop culture. How I long for real political leadership that doesn’t play to the basest desires of the mob. The following Friday 19 July, I went and spoke at St. Ursula’s Catholic High School about peace and faith. For ninety minutes, I was given 60 young minds (plus their teachers) to challenge and talk with. It was fantastic. At the same time, several of the Peace Convergence went back to the Western Street Barracks and protested. Some of them ended up blockading the driveway in an attempt to disrupt the War Rehearsals. Four were very quickly arrested by police and slapped with severe bail conditions, restricting them from going within 500m of any place aligned with TS. From reports on the Peace Convergence website and what my friends told me, the police response was heavy with 10 police showing up within a few minutes. On top of this, a hire car we had, plus the Peacebus were targeted for constant “random” breath tests and license checks. Jessica got breath tested “randomly” four times in two weeks, I got done twice and several others got pulled over a few times as well. It feels like we were targeted and the police were trying to say “we’re watching you”. Again, if we were the biggest threat happening at the time, we live in a very safe country and don’t need any American protection at all! The following Sunday, about thirty-forty of us turned out at Yeppoon for the biennial Peace Parade and Concert. It was a very small turn out, I’m told, compared to previous events. We did not have a permit and so walked on the foot path. Amongst us were the Peace Convergence and locals who were concerned with the environmental effects of the TS Military Exercises happening in nearby pristine coastal rainforest. The police presence was heavy. One Peace Convergencer saying “I was filmed and photographed more here than I was at the G20 protests.” When you consider the G20 is a bastion of possible violent protests against world government powers and Yeppoon Peace Parade overwhelms the local fish and chip shops for the afternoon, you get a sense of the heavy-handed police monitoring and enforcement of laws that had not been broken. When I first got to Rocky Graeme was enthusiastic that we were ruffling feathers and causing commotions within the military encampments. I thought this was a little egotistical. But to see the amount of police out in force and keeping very watchful eyes on us, I started to wonder. Either the police in the area are way overfunded, or Graeme had a point. The concert was great. Just off of the beautiful Keppel Bay beach, great sounds and rousing speeches. My favourite was the local Peace Choir. At the end, they sat in the crowd and we all had a sing-a-long to our favourite peace anthems. I turned in early that night, I had a big few days in front of me and I needed the rest. I’m going to be careful with some of the detail in this. Firstly we committed a Commonwealth Offence and I don’t want to name any parties that helped us. Secondly we found a really great hiding spot, and I don’t want to give it away. I’ll call the people my friend or friend/s and the hiding spot “Camp Peace Pilgrim” (or CPP when I get too lazy to spell it all out). Monday after the peace concert we rested and made preparations to spend a few days out bush. The idea was to sneak onto the Shoalwater Bay Military Training Area and try and disrupt or even shut down the Exercises. There was only two of us walking on this year, so I didn’t have high hopes of disrupting the games and getting our political leaders to question the costs and value of the US/Australia Military Alliance, but I was hopeful of speaking to a few of the participants and maybe holding up a main road for the time it took the police to come from Rockhampton to arrest me. We left our home stay early in the morning and our friend drove us in the dark to a location adjacent to the Military Training Area. After a 10 minute walk, we came to the fence and the sign warning of trespassing, live ammunition and militant Empire building in process (all true except the last one). Another friend took the photo and we parted ways. Strenuously, we walked another few minutes into the bush and sat and drank water in the dawn light. I ate a small breakfast of a boiled egg and nuts and Graeme and I lamented not bringing any equipment with which to make tea. After a while (to give our other friends time to get away and issue the Press Releases) we turned on our GPS (Global Positioning Systems) and set out for a Peace Shrine that had been set up in the 2011 Walk-On by other peace activists. The Shrine was dedicated to Franz Jaggerstatter, an Austrian Peasant who refused to join the German Army after Austria’s Union with Germany in 1938 (please check that’s the year, I could, but you’re already on the net). For that heroic stand against a brutal regime, Franz went to the guillotine. We got to the Peace Shrine a few hours later, having walked through the serene, beautiful forest. The serenity was only broken for a few moments with the sounds of gunshots. I assumed, judging from the sound, but I’m no expert, they were blanks being fired as part of the training. We sat at the Peace Shrine and adorned it with a few reminders of Peace. We prayed for peace, an end to militarism and conflict and for guidance in the rest of our journey. After an hour or so at the shrine, and again without any tea, we headed west, then north, then east, than south. And found our way after about an hour of bush bashing found ourselves back at the Peace Shrine. Having cleverly thrown anyone following us off the track, we then headed west towards the airfield. We did not take a lot of gear on with us and I was half prepared to give myself up that day, so I wanted to find the main roads and scout out a good spot. After a while (maybe a few hours, maybe a few days) Graeme and I decided that I would make my stand and be arrested. My aim was to stay on the main road for as long as possible and disrupt or stop a part of the exercise. Graeme was going to stay with me and take some photos then depart. Graeme wanted to spend another 24 hours in Shoalwater Bay on his own. Whilst this carried some risks it would also confirm to the Australian Defence Forces and media that we were in the vicinity and live firing exercises should be stopped. So we picked a spot on the road and I waited. An hour and a half later we looked at the maps and I decided to head for the airport. If no convoy came along, I would walk along the airstrip and carefully make my presence known. In my hand I had tracts from Peace Pilgrim. Peace Pilgrim had walked around America for thirty years with virtually no possessions. She fasted until given food and walked until offered shelter. Her mission was to spread the message of peace which she summed up as “Overcoming evil with good, falsehood with truth and hatred with love.” The tracts were brief summaries of her writings and teachings. I had about 15 to give away to any Exercise participants I found. Walking towards the airstrip was good, because I got to walk down the middle of the road rather than bashing through the thick scrub. We’d gotten to an intersection that was only a few hundred meters from the airstrip and I was preparing myself to walk on to the airfield when a Humvee convoy came my way. This struck a chord with me, because Vince had told us some Marines had PTS from being told by their commanders not to stop a convoy for any reason. In Iraq this even meant that small children were run over because it was too risky to stop a convoy. Some militants in Iraq used children as a distraction. A small child on the road, convoy stops, militants attack convoy. So convoy leaders were ordered to run down children if they saw them, to not put their convoys at risk. So there I was, with a convoy heading towards me. I stood my ground, lifted my left hand up with the peace tracts and my right hand up, open, empty in a sign of peace. The convoy came to a halt and over the microphone I heard the voice of the driver “Sir, step away from the vehicle!” I stood with my hands raised, my thoughts racing “if I were in Afghanistan or Iraq, I already would be dead”. The large 89mm machine gun on the roof of the Humvee was pointed straight at me. Having been in the military I also recognised the blank firing attachment which let me know the gun was loaded with blanks. At no time did I feel threatened or scared of being injured. The voice boomed again from the microphone “Sir! Step aside from the road and away from the vehicle”. There was a moments silence, the doors opened and I was facing two boys of about 19 or 20. They were fully “bombed up” (had all their pouches full of ammunition and loaded up with combat equipment). I did what non-violence teaches is the best way for resolving conflict. I engaged in communication with these two boys. I spoke about our need to love our enemies, our future depending on disarming and the call for us to work together for peace. I acknowledged that it was a hard road and was not the easy answer, but it was the most humane answer. After about five minutes the boys commander came forward. A latino Gunnery-Sergeant. He engaged with me for about an hour of conversation. In this time, Graeme had taken photos and departed. He went through the bush and towards the airfield. I knew he didn’t want to get caught, so I assumed he would circle around and take more pictures from the bush. How wrong I would be. I don’t know how effective my voice was to those three men. I don’t know if I achieved anything more than hold up their convoy for an hour or so. I do know that in court the police prosecution claimed that Graeme had “caused millions of dollars’ worth of equipment and personnel to be put on standby” whilst official ADF media releases stated that “there was no disruption to Talisman Saber”. I hoped I planted a seed. I hoped that in the future there is a record that not every human stood for the madness of never-ending war and destruction and some us tried to take a stand against global military empire. After a while the Military Police turned up. I sat on the road and they said if I didn’t move they would move me. I was tired from talking to the Marines, so I complied. As the Gunnery-Sergeant left he yelled out “Peace M**haF***a”. I was touched. She asked me more questions, but I stayed silent after that, fearing I’d given too much away already. In my mind’s eye, Graeme was sitting in the bush behind me, taking more photos and preparing to go the opposite way of the search party. I started talking about the atrocities of Abu Ghraib, the effects of PTS, the fact that 15 Australian Vets had committed suicide this year alone. Graeme being there and being filmed, gave me a chance to rest. He spoke about the dead Iraqi civilians, the urbicide at Fallujah, the cost to Australian families of Afghanistan. After about half an hour QLD Police turned up and took us away. We were whisked to Rockhampton and held in the watch house. In the back of the police sedan on my way in, my ego was quite stroked. I knew I was going to the watch house to be detained by the authorities. In my mind I was the embodiment of Gandhi, Luther-King, Day and even maybe, a little of the Jewish Carpenter. In the holding cell, Graeme and I did some Buddhist chants. Then we were moved to another room, fortunately the TV was broken. In there I got to know a man. A man I’ll call Martin, or Marty. Marty was a 30 something Indigenous fella. After a bit of time, he told me he would not bother with peace protests, but if we ever did one to keep innocent people out of gaol he would be in. With that he opened up and told me his story. “We never got close to applying for bail until today and now they’re saying the paper work hasn’t come through, so we go back to gaol.” Marty went on to say that he felt like his public appointed solicitor was not communicative and had not voiced any opposition in court when the Crown continually applied for adjournment until further notice. Marty was the only driver in his home and had said his partner and three kids had been severely struggling without him there. Meeting Marty and spending my one night in the watch house, my ego plummeted. I was a privileged white boy with passion and dedication, but I only had room to exercise that because of my social privilege and position. I feel proud of what I did and my stand for peace, but after meeting a real victim of the systemic violence in our society, a poor, black man stuck in the system I felt more like kid being caught with some recreational drugs than the Great Social Justice Activists of history. The next morning Graeme and I face court. At the last minute they added the charge of taking photos of a defence installation onto my trespass charge. I am currently, thanks to the generous pro-bono work of David Mills in Rockhampton contesting that charge. If I decide to plead guilty, the matter will be transferred to Brisbane where I can be sentenced for both. Graeme pleaded guilty to everything, trespass, breaching bail and taking photos of a defence installation. He was fined a total of $946. A big thank you to Dale Hess who has already donated $250 to me to cover my fines. Once I get sentenced, I may appeal to the conscience of supporters out there to cover the rest. Personally, I see Talisman Sabre/ Saber as the weak point of Australian military policy. I know Rockhampton is a long way out of the way. But I think there is a chance up there. If we, the consciousness of Australia can raise enough protest up there, we can challenge the narrative that Australians whole-heartedly support the US Alliance that has led to the deaths of 40 Australian soldiers in Afghanistan, 15 suicides from PTS and the physical maiming of 256 and the mental maiming of maybe 2000 more Australians. This is not to mention the million or so dead civilians in Iraq, the tens of thousands killed in Afghanistan, the cost of 31 billion dollars to the Australian People and increased military spending. Why are we spending billions of dollars on these tools of war whilst making schools and hospitals scrounge for the funding they need? We can do better. 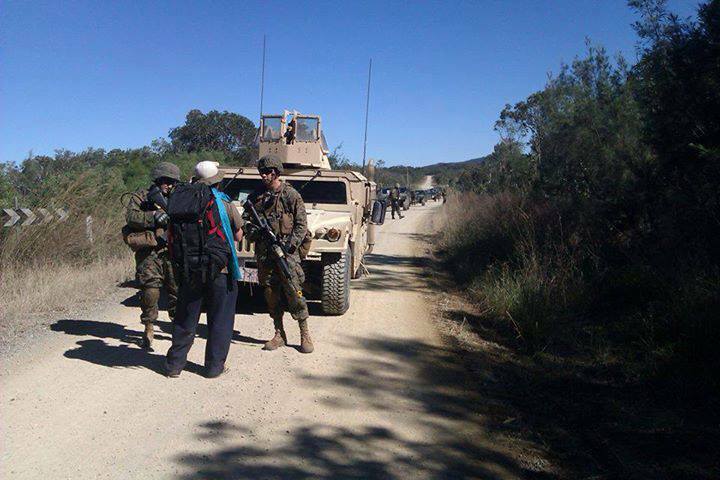 If we can get, in 2015, 100 Australians to walk on to Shoalwater Bay and really disrupt the Exercise. If we can show to the media and the Australian Government that there is not universal support for this Alliance and these wars, then we have a chance of really changing the future history of Australia’s place in the region and the world. What do you say? Can you give a week to ten days in July – August 2015 for Australian and World Peace? Do you truly believe that as a country and as a species we can do better than mindless militarism and following the largest military machine in history into bloody and dirty wars? 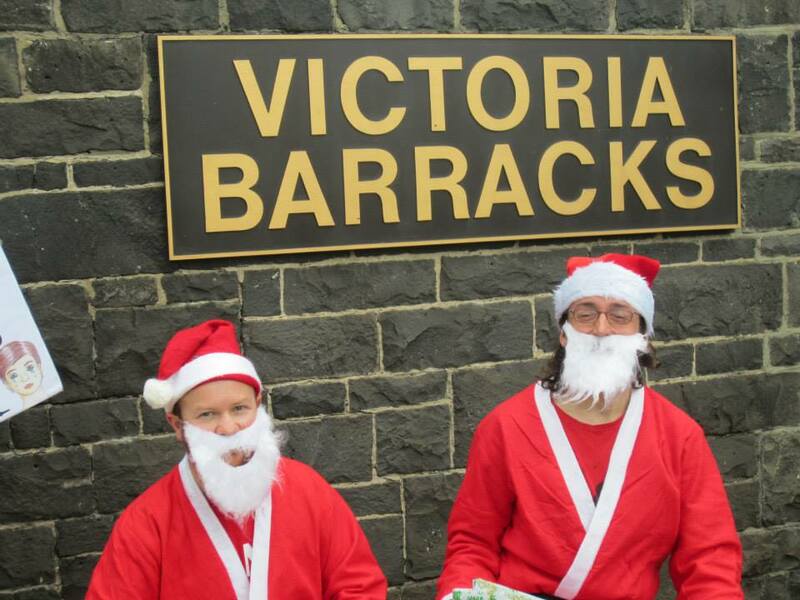 Then how about committing to planning, organising for 2015 Talisman Saber? Why not commit to a beautiful few days in the bush walking and working for global peace? Help to be a voice for the innocent victims of war on all sides. I hope to see you in Rockhampton for the 2015 Talisman Saber Exercises.